They are the rock stars of children's literature, selling millions of books and attracting thousands of adoring readers large and small at events held around the world. But Andy Griffiths and Jeff Kinney say groupies are not a part of their touring schedule. Andy Griffiths (left) and Jeff Kinney, of <i>Treehouse</i> and <i>Wimpy Kid</i> fame respectively. “If only,” jokes Griffiths, whose latest book in his Treehouse series was proclaimed the fastest selling Australian work of fiction in a decade earlier this year. 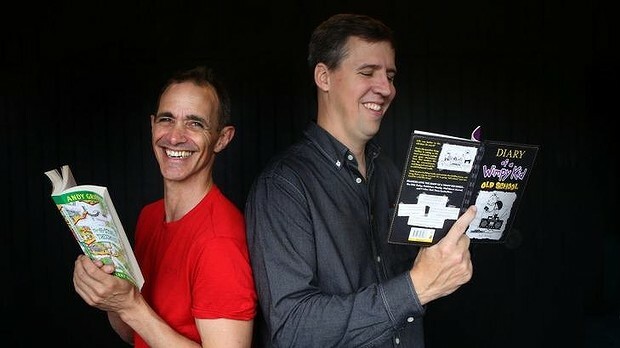 Griffiths and Kinney, author of the Diary of a Wimpy Kid series, will share a stage on Sunday at the City Recital Hall in Angel Place as part of the 2015 Children's Festival of Moving Stories. Griffiths says he has compiled some of his favourite Wimpy Kid moments and plans to interrogate Kinney about his creative process. The audience will also have the opportunity to question both authors during the event, which is organised by the Sydney Writers' Festival. Kinney says children are often eager to find out about new characters and plots, although in China he was asked about the symbolic importance of the number of hairs he drew on a character's head. Both authors agree children share similar reading interests regardless of where they are from. Kinney is travelling the world to promote Old School, his 10th Wimpy Kid book, which he says is a change of pace from his usual touring schedule. “Usually what I do is tour the United States on a bus and we do seven events a day and then at night we do karaoke on the bus to blow off steam,” he says. His favourite karaoke selections are tracks by Muse, Bon Jovi and Lyle Lovett. Griffiths says he has developed a “stand-up comedy schtick” during two decades of touring schools as a visiting author. “I've always loved winding children up, telling them something silly and seeing how long you can do it before they say ‘That's not true',” he says. Griffiths continues work on The 78-Storey Treehouse, which he will hand over to collaborator Terry Denton to illustrate in the new year. Kinney says he will probably add to the Wimpy Kid series, and come up with more adventures for his protagonist Greg Heffley.